But that’s still three weeks away or so… and there’s other babies coming, hopefully, before that! Meet my two broody hens. These are two from my last year’s hatchery bought chicks. I only have six left… Three are Buff Rocks (including these two), one Welsummer, and two Red Stars. Of course, the “freebie” of the bunch turned out to be my Black Cochin rooster. He’s been walking a fine line, he’s taken Victoria and Eden, he’s bluffed me, and made a dash for a grandson and ran into my foot. I’ve said if I can get some chicks, he may just have to go down the road. Well, the big ol’ boy may not have much time left. He is actually much nicer than my other roosters were, nicer to the hens, and we respect each other’s space, but he is a big guy, and he could knock down a grandson… I just need a temporary home until he is needed again next spring! But there I go… counting my chickens before they hatch. Anyway, these two girls are happily setting on two clutches of eggs… and they will be a strange looking bunch if they hatch. They will have hybrid vigor on their side, that’s for sure! 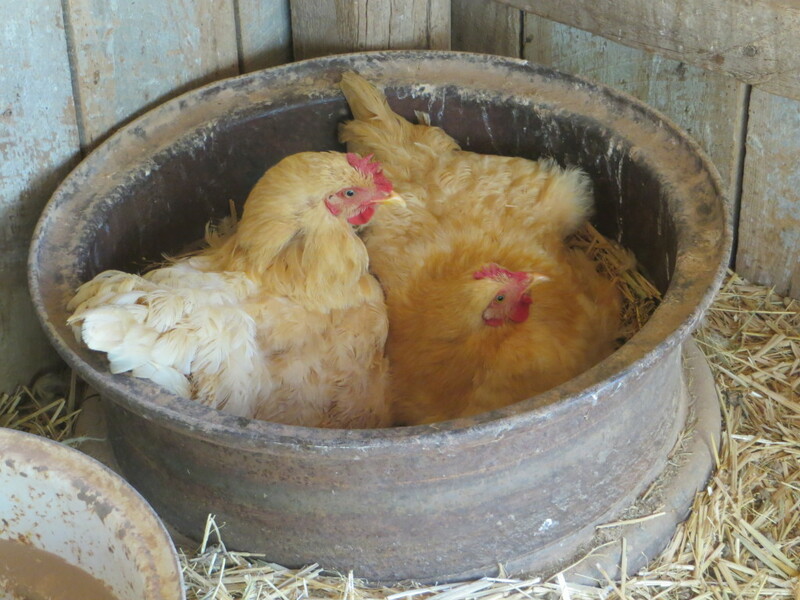 Since this is the most popular nesting box, all of my chickens laid some eggs here before these two took control. 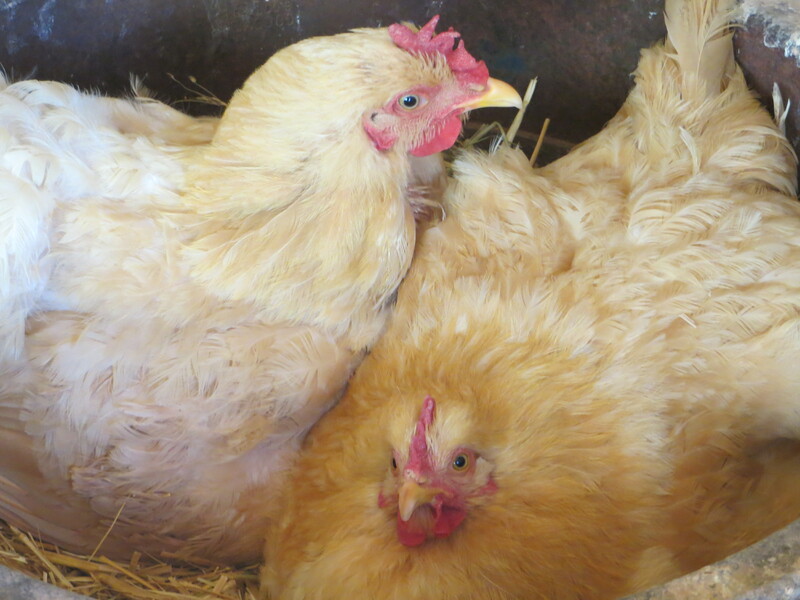 I figure Saturday is the due date… It’s day 21 for one hen, the other started two or three days later. When one gets 6 or 7 chicks hatched, I’ll pull her off and stick her in the dog pen with her bunch, then they won’t confuse or fight over the remaining ones. That’s my plan… We’ll see how it actually goes! Thanks for sharing a peak into your life with us over at Country Fair Blog Party! I love the perspective it gives me from my city life! I grew up in rural Kansas, and miss it! Our buffs are always going broody here. I tried letting one sit on some eggs last year but they never hatched. I’d love to try it again, we’ve got quite a few broody, but I just don’t know if I should since we have a lot of cats that might get them. I will be interested in seeing how your hatching turns out. Shelly recently posted…One GOAT of A Day! Babies do abound this time of year! Fingers crossed all of your eggs hatch. Thank you for coming and linking up with the Country Fair Blog Party (CFBP)!! Laurie recently posted…CFBP – May – CELEBRATE! Carol, it is so interesting for me to learn about brooding hens and rooster bullies! I really appreciate that you are sharing that experience and knowledge with me and others who so enjoy your photo blog and interesting life andwho haven’t been lucky enough to experience it ourselves! Thanks from a “deprived” town gal…Hee hee! Chicks and puppies. You are going to have so much fun with them. I may have to trek to Wyoming to get a fix! I bet you get a lot of little chickies…… they sure are focused when broody…. not even caring about eating etc… they found the best nest – so cute with both in it…. Those buffs sure seem to go broody more than others. We have Buff Orpingtons here who have been insisting on it for quite some time, while I just keep stealing all the eggs, because we’re not ready for chicks. The buff was the one to go broody with my last flock too. Your rooster sounds a lot like the one here. He’s a very large, good looking, Black Star. He never bothers me. He’ll flap and crow, but never bother me in the slightest. My brother-in-law and sister though, that’s a different story. He doesn’t like them, probably because they’ve been around the chickens less, as I take care of them. I wouldn’t trust him around the kids. How did you get so luck as to get some broody hens! I have 10 hens and NONE of them have any interest in brooding! We named our rooster Stewpot since we are always threatening to cook him if doesn’t stop being such a bully!